This timely, one-stop reference is the first on an emerging and interdisciplinary topic. 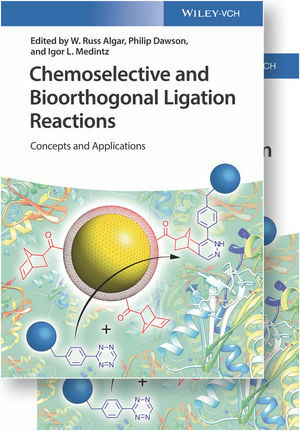 Covering both established and recently developed ligation chemistries, the book is divided into two didactic parts: a section that focuses on the details of bioorthogonal and chemoselective ligation reactions at the level of fundamental organic chemistry, and a section that focuses on applications, particularly in the areas of chemical biology, biomaterials, and bioanalysis, highlighting the capabilities and benefits of the ligation reactions. With chapters authored by outstanding scientists who range from trailblazers in the field to young and emerging leaders, this book on a highly interdisciplinary topic will be of great interest for biochemists, biologists, materials scientists, pharmaceutical chemists, organic chemists, and many others. Igor L. Medintz is the U.S. Navy's Senior Scientist for Biosensors and Biomaterials at the U.S. Naval Research Laboratory in Washington, D.C. He obtained his Ph.D. from the City University of New York and then spent three years as a postdoctoral researcher at the University of California, Berkeley. He has coauthored over 200 scientific publications, 18 patents, and won several awards including the 2013 Arthur S. Flemming Award for Basic Science. W. Russ Algar is an Assistant Professor at the University of British Columbia in Vancouver, Canada, and a Canada Research Chair (Tier 2) and Michael Smith Foundation for Health Research Scholar. He obtained his Ph.D. from the University of Toronto, and then spent two years as a postdoctoral researcher at the U.S. Naval Research Laboratory in Washington, D.C., USA. He has authored over 70 scientific publications and won several awards and fellowships for his research. Philip Dawson obtained his Ph.D. under the guidance of Prof. Kent. After two years postdoctoral research at Caltech under Prof. H. Gray he became Associate Professor at the Scripps Research Institute in La Jolla, USA. His research field is synthetic protein chemistry. He has published more than 100 papers in international journals and has won several awards (Max Bergmann medal, Vincent du Vigneaud Award of the American Peptide Society).